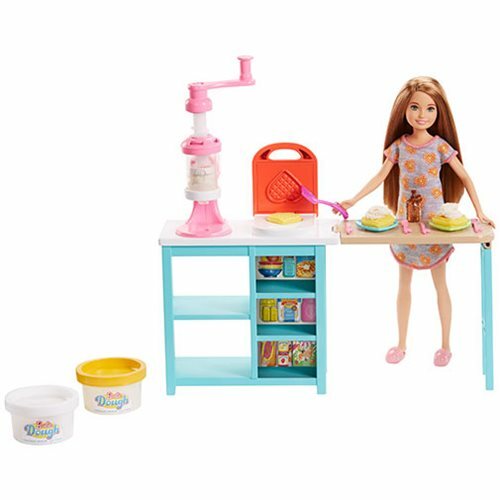 With Stacie doll and her breakfast playset, young chefs will find making breakfast sweet! The kitchen counter comes with a waffle-maker and whip cream machine that work with the two colors of included dough to whip up a tasty-looking meal. Additional accessories include a spatula, two place settings, and a bottle of chocolate sauce add the perfect ingredients for storytelling fun. Cooking up breakfast is easy, especially for small hands. First, fill the waffle-maker with yellow dough, press the lid down and lift to reveal a heart-shaped waffle. Use the spatula to place on a plate then put under the whip cream machine. Fill it with white dough and turn the crank to top the waffle off with a swirl of whipped cream, then serve at the counter tabletop. Young chefs can cook up so many stories with Barbie Stacie Breakfast Playset!